In light of the progressive movement in American politics at the beginning of November regarding the historical milestones made by women in the midterm elections, I thought I would share an insight into the wonderful Voice and Vote: Women’s Place in Parliament exhibition I visited last month. When I left the British Museum earlier this year, I was kindly gifted membership to the Women’s Library as part of my leaving present (alongside tickets to see my idol, Stacey Dooley and an array of feminist goodies!). The Women’s Library LSE, based at London School of Economics, holds 500 archive collections and a significant museum collection of over 5000 objects, much of which dates from the late 19th century. 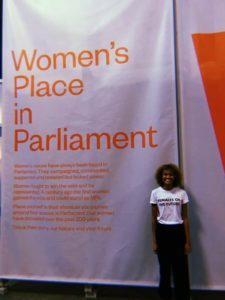 My first Women’s Library event was a trip to Westminster to visit the ‘Voice & Vote: Women’s Place in Parliament’ exhibition. The tour was led by Mari Takayanagi, Joint Project Manager of Vote 100 and a fellow Women’s Library member. The major exhibition displayed at Westminster Hall was created to give visitors a better understanding of the campaign for votes for women in the UK and the representation of women in UK Parliament and politics. In 1834, a large fire demolished the original Westminster building leading to a new Palace being built between 1840 – 1876. The new Palace of Westminster included a purpose-built ‘Ladies Gallery’ which meant that women could officially listen and watch debates in the Houses of Common rather than hiding in the Ventilator. The Ladies Gallery was nicknamed ‘The Cage’ because it had large, heavy metal grilles covering the windows, both restricting the women’s view and ensuring they didn’t ‘distract’ men in the Public Gallery. 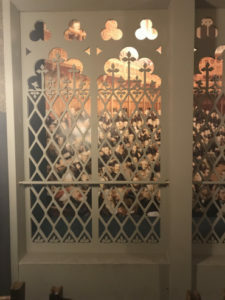 In the 20th century the space became known for protests by suffragettes campaigning for change and the metal grilles were eventually removed in 1917. The reconstruction of the Ladies Gallery in the exhibition gave a sense of the rules, space and views that women would have experienced whilst listening to parliamentary debates from their newly designated area. The cream paneling represents where the heavy grilles would have been.